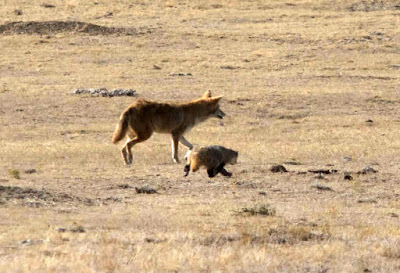 A US Fish and Wildlife Service staffer got a series of pictures of a coyote and a badger hunting together, which are published on the USFWS Open Spaces blog. Each partner in this unlikely duo brings a skill the other one lacks. Together they are both faster and better diggers than the burrowing rodents they hunt. These partnerships tend to emerge during the warmer months. In the winter, the badger can dig up hibernating prey as it sleeps in its burrow. It has no need for the fleet-footed coyote. Meanwhile, here in southern Colorado, I was talking this afternoon with a Colorado Parks and Wildlife employee who lives on the prairie west of Pueblo. She said that she had seen from her house a coyote, a badger, and a harrier (hawk) apparently working together. Domestic falconers team hawks with dogs, so why not in the wild? Probably that is where the idea came from. Why not, it makes perfect sense to me. My husband and I were driving a dirt road near Hartsel and saw a strange animal beside the road. As we got close, the "animal" turned out to be a golden eagle and a badger. The eagle flew across the road and the badger ran beside the road and went into its den. It came half way out of the den and relaxed on its stomach and watched us. It didn't seem stressed in any way. I've always wondered what they were doing together. Maybe they were eating something together? Have heard about such activity, but it's neat to see visual proof that it happens.